Can We Predict Forward Alternative Investment Performance? My friend Ben from A Wealth of Common Sense poses the interesting question, How Should Alternative Investments Be Benchmarked? Please go read his post for a number of interesting thoughts on that topic. In this post, rather than rehash his arguments, I'll go a different direction and articulate what drives the performance of alternatives (i.e. hedge funds / liquid alts) to see if we can predict forward performance (which in a backwards way, may provide some insight into how an investor might think about benchmarking performance). What's interesting to me is that one of the main reasons I regularly hear why investors are allocating to hedge funds, is actually a reason why hedge fund performance has been so disappointing. Back to Ben's post for a specific example in the form of a comment from his reader (bold mine). Interest rates are too low and stock market volatility is too high so we have to hold some alternatives in our client portfolios. Low interest rates are actually a reason not to own alternatives. People seem to forget that alpha is a "cash plus" return stream. 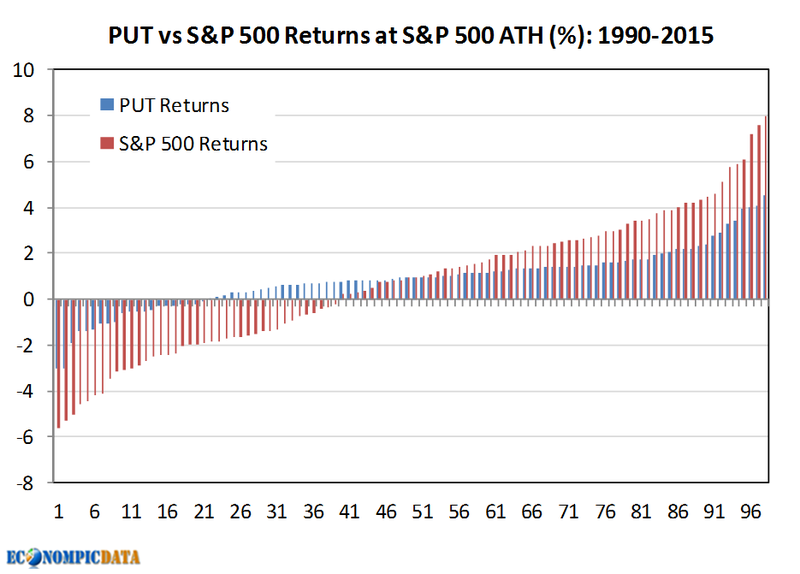 The excess performance of a hedge fund (with 100% of returns driven by alpha) will be a certain %, which added to the cash rate gets to the total return generated by the hedge fund. The same skill that generated a 10% hedge fund return when cash rates were 5% (5% alpha + 5% cash), only generates 5% when cash rates are 0%. As a result, all else equal, the lower the cash rate, the lower the relative performance of hedge funds. While interest rates are an important consideration when making an allocation to an alternative manager, they are not enough to predict future relative performance vs a traditional stock / bond allocation. 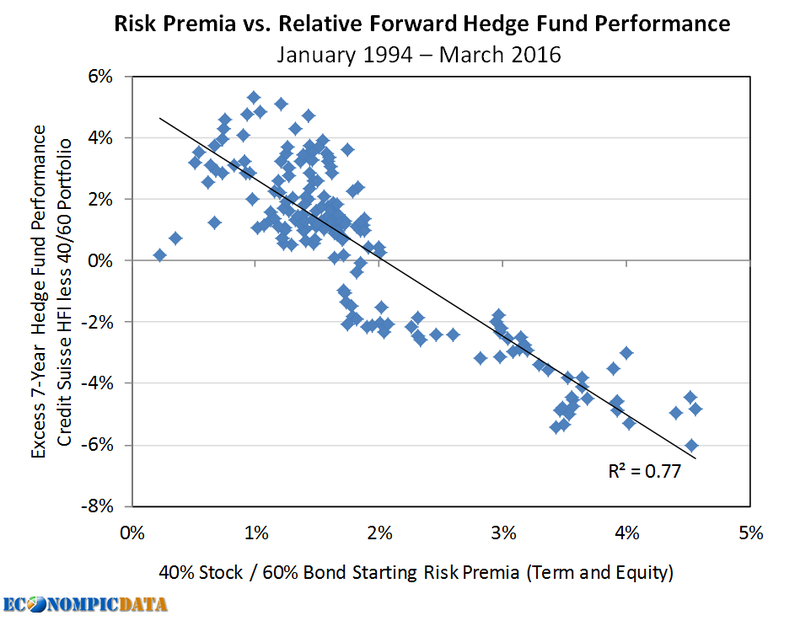 One key is to look at the level of risk premia (both stock and bond risk premia). The difference between the expected return on a security or portfolio and the "riskless rate of interest". I then subtract out the riskless rate of interest (which I define as the average 7 year forward t-bill yield) to get the premia, while the 40/60 blend is a 40% equity risk premium / 60% bond term premium blend (given the average hedge fund beta is ~0.40). In this analysis, I forecast future cash rates moving up 50 bps / year to 2% and staying there (more on this later) to get the stock and bond term premia for forward years that have not yet occurred. 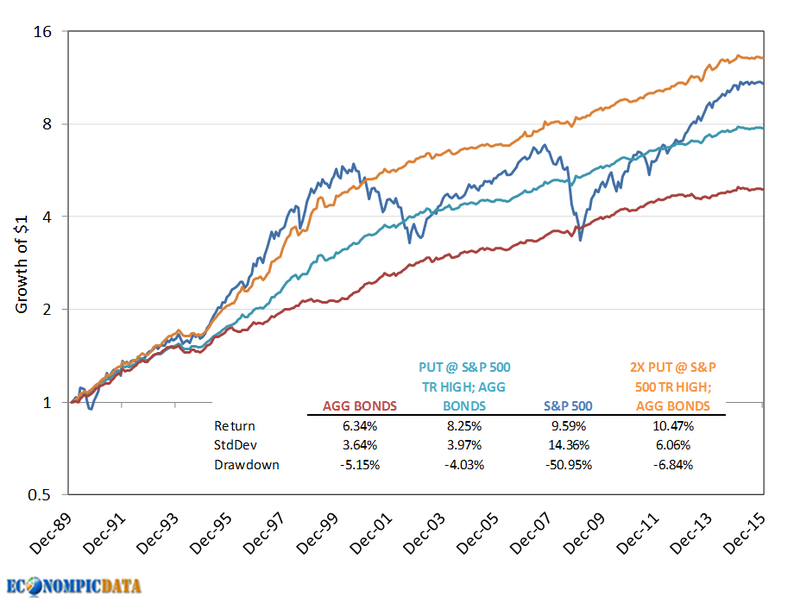 In terms of predicting alternative fund vs. stock / bond performance, the opportunity cost of allocating to a hedge fund is largest when these premia are high and lowest when they are low (or negative). 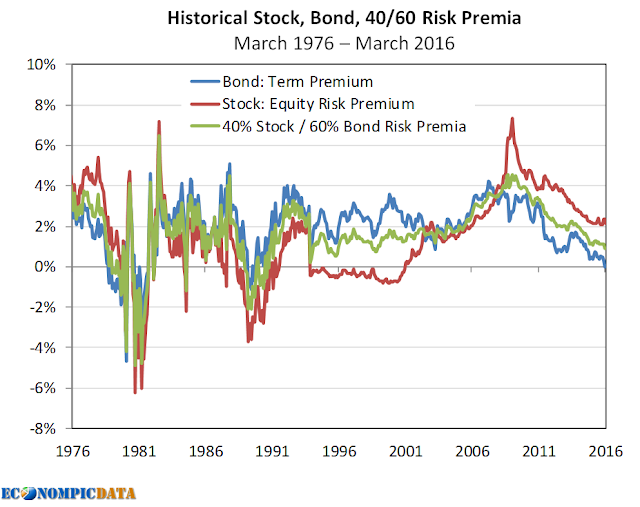 As you can clearly see from the chart above, stock and bond risk premia were very low in the late 1970's / early 1980's when cash rates were elevated, high in the mid 1980's when Volcker was able to control inflation pushing down cash rates, subdued in the 1990's when stock valuations got extended, then huge in the mid to late 2000's after the financial crisis that pushed stock valuations lower and cash rates to 0%. Given the above framework, you can see how the mid 1990's were a great time to be in hedge funds from both an absolute perspective (cash rates were high) and relative perspective (the equity risk premium was low), while the exact opposite situation has been true for the last 7+ years. The chart below takes the above starting risk premia levels since 1994 and plots them against the relative forward performance of the Credit Suisse Hedge Fund Index (I can only get returns starting in 1994) vs. a 40% stock / 60% allocation. What Can We Predict from Here? Given this analysis, it appears the opportunity cost of hedge funds is once again approaching "fair value" given the much lower bond term premium, BUT an allocation will be largely dependent on an investors view of the direction of cash rates. It is less important to relative performance whether cash rates are currently low, but whether they will stay low. Should they move much higher than the 2% modeled in my analysis, then now may actually be a good time think about alternatives. The first post outlined how avoiding bear markets (by only holding equities when they were near an all-time high) has lead to very strong risk adjusted returns, going so far to show the great performance of a strategy that only allocated to stocks when they were at an all-time high. The second post outlined what an investment in put writing provided and pointed out the surprising fact that selling puts on the S&P 500 has actually resulted in better risk-adjusted returns when markets were calm than when volatility was heightened (and premiums were higher). I recommend reading either / both if interested in more detail. When Does Put Writing Make Money? Selling puts make money when the premium collected is greater than the decline in the market (relative to the strike price) from the time the puts were sold to the time the puts expire (i.e. ignoring financing costs if you sold an at-the-money put, collected a premium worth ~5% of the notional value of the S&P 500, and the S&P 500 went down less than 5%, the trade was profitable). Thus, despite the lower premiums collected, selling puts more consistently make money when market volatility is low because the market is much less likely to decline (i.e. selling insurance to safe drivers is more lucrative even if you charge a lower premium). Going one step further, the chart below shows all forward one month returns for the CBOE PutWrite Index and the S&P 500 Index only for periods when the S&P 500 reached an all-time high the previous month-end going back 25 years. The model below is a simplified / lower risk version of one I've kicked around for a while, but it has resulted in an interesting historical path of returns. The caveats of how this will perform going forward should be pretty obvious, namely that the path of the S&P 500 is hugely important. Caveats aside, the relative historical returns of the non-levered model were ~2% higher annualized than bonds with an almost identical risk to the index, while the 2x levered version provided returns that were "stock-like" (~4% higher than bonds), but with a 60% lower standard deviation and a 90% lower max drawdown than the S&P 500. At some point in the likely distant future, I hope to put out a white paper with a much more in-depth background and details of the broader model. For now, please feel free to reach out to me with any thoughts on Twitter @econompic. Growth or Value in a Low Growth Environment? Financial Advisor Magazine recently published an article by the CIO of LPL titled 'Value Comeback' making the case for Value. There were some interesting points in the article connecting the recent growth outperformance with lower interest rates and/or oil, but the following point on low growth being a driver of the growth outperformance did not make much sense to me. One of the main arguments against value (and in favor of growth) in recent years has been the slow global growth environment. When there is not a lot of growth in the economy or corporate profits, then it logically follows that the market would pay a premium for the companies that are generating growth (what we have referred to as motorboats, which can grow without a macro tailwind, as opposed to sailboats, which need economic growth to grow). The data support this. 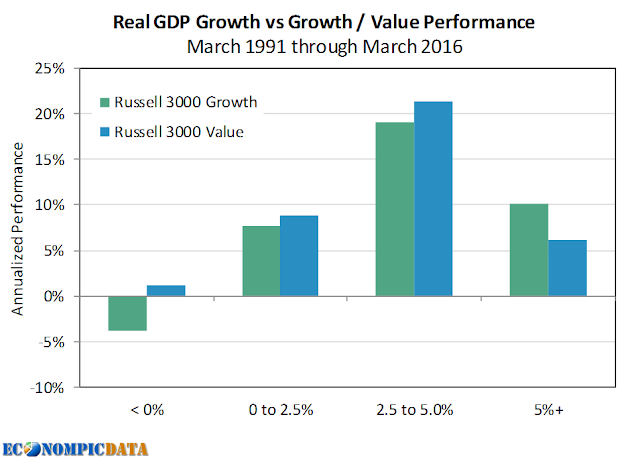 Over the past 25 years, when economic growth is slow (real gross domestic product [GDP] below 2.5%), growth outperforms value by an average of 4.1%, and beats value two-thirds of the time. This caught my eye because in a previous post I noted that despite the outperformance of growth over the past 3, 5, and 10 years, it wasn't multiple related (i.e. investors have not paid a larger premium for growth stocks). In fact, growth stocks have gotten relatively cheap by the measure of forward P/E (the current premium is about 20% for growth vs. the 30 year average of ~40%). In addition, I always assumed that growth did better during strong periods of high growth because that's when optimism tends to be highest and growth stocks become bid up during that exuberance (i.e. the roaring 90's). So I ran the numbers for the same period that was reflected in the article, looking at Russell 3000 Growth and Russell 3000 Value (all cap indices) as my growth and value proxies. I then annualized the performance for each quarter when real GDP was < 0%, between 0% and 2.5%, between 2.5% and 5.0%, and 5%+. The results show value has historically done better in all environments EXCEPT when growth was quite high (above 5%). Much of the historical outperformance of value did coincide with much higher valuations for growth stocks, so past outperformance of value vs growth may not happen even if growth remains sluggish going forward. In addition, the depressed price of commodities (due to the global slowdown) may make value (where most energy companies are classified) as the place to be if the economy expands quickly, However, it does clearly show that economic growth has been good for stocks in general and high levels of economic growth have historically been especially good for growth stocks.